Cue the hunchback, talking gargoyles and gypsies! I kid. My trip to Paris wouldn’t have been complete without a stop at the famous Gothic cathedral in the heart of the city: the Cathédrale Notre-Dame de Paris! If you ever visit Paris and find yourself here, don’t get discouraged by the long lines. This visit is well worth the wait. We chose to take an Uber to get to this destination. The Cathedral is located at 6 parvis Notre-Dame – Place John Paul II and, being such a historic landmark, is accessible by bus, Metro, and has nearby Vélib’ bike sharing stations. Of course, any type of Hop On Hop Off/city sightseeing tours will have a stop at this location. For hours of operation, visit their official website here. The first stone laid toward building the cathedral was done 1163! The museum recently (in 2013) celebrated its 850th anniversary. My first tip, with any tourist-heavy destination, is to arrive early! This is crucial if you want photos without a lot of distractions in the background. Given that we were in Paris for only a few days, we had to pick-and-choose which attraction to have that experience with. From my last entry, I have no regrets about choosing the Eiffel Tower for that experience. Stuck in line like the rest of us? Don’t worry – it goes by quickly. While you’re out there, make sure to really just take in the exterior of the west facade. I stood there for a few moments, camera in hand, not even taking photos. I was simply taking it all in. There is so much detail in every corner and edge of the design in this landmark. Take a look for yourself! The archway below depicts The Last Judgment. Stepping into the main chapel, or the nave, I needed to take a moment to just take it all in. We were there just before the peak of the day, so light was coming in from the beautiful stained glass windows – called the Rose Windows. The chandeliers were lit at this point, and the intricacies of the design of this main chapel make the trip in itself worth it. Make your way around the walls and you’ll find beautiful smaller chapels dedicated to different religious figures or relics. Don’t leave without checking out the famous Casavant organ, which originates in 1330. It has since been restored and now the titular organist hosts tours to get you up close to the organ and listen to it being played. For information about these tours, click here. You can take 387 steps up to access the north tower of the cathedral. The south tower is where the ten bells are housed, including Emmanuel, the largest (13 ton) of the set. You can also access the crypts under the square in front of the Notre-Dame de Paris. These crypts, known as the Crypte archéologique de l’île de la Cité, walk you through the urban and architectural development of Île de la Cité (island of the city – the historic heart of Paris), along with the ruins of medieval and classical remains. I usually lump my sightseeing into “packages” – 3 stops that are near to each other. 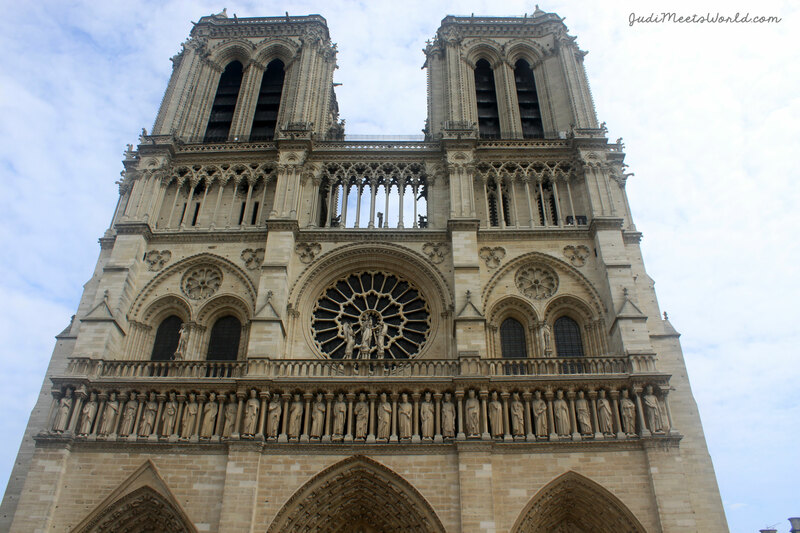 I feel that the Notre-Dame de Paris is so rich in history that it deserved a post in itself. When planning your visit, I would recommend setting aside an hour (including line-up time) if you wanted to just do a “quick” photo stop. Give it more time if you’re planning on doing a self-guided tour and really spend time at each chapel, or take time sitting in the nave. My mother has plantar fasciitis, so this trip was a win-win. She was able to sit in one spot and enjoy the beauty of the nave while I went around and did a self-guided tour around the chapels. Stay tuned for more of my Paris adventure!